My usual order comes topped with layers of refried beans, shredded and generously black peppered chicken, finely chopped iceberg lettuce and ridiculously good salsa verde. 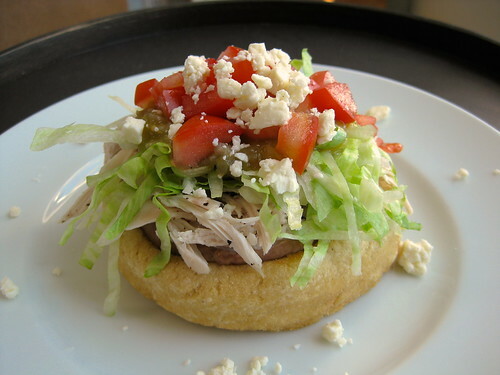 Thankfully, sopes are easy enough to manage at home, and are an absolute breeze if you’re comfortable with frying. If you want to make everything from scratch, that’s cool and I’ll tell you how, but you can easily substitute store-bought refried beans and rotisserie chicken to save time and effort. Just promise me you won’t use the mass-produced rolls of sope shells that can be found in some grocery stores, they’re not even close to being the same — capeesh? Over medium heat, warm about 1/2″ of oil in a cast iron skillet until shimmering. In the bowl of a stand mixer fitted with the paddle attachment, combine masa and salt. Add boiling water and mix on medium for about 1 – 2 minutes or until dough comes together in a ball and is cool enough to handle. Divide dough into 8 equal pieces. Roll one piece into a ball, pat out into about a 3″ wide disk, pinch sides up to form a sort of cup shape that fillings (sides will be about 3/4″-1″ high, middle 1/2″); set aside. Repeat with remaining dough. Transfer 2 shells to the oil, bottom side up. Cook for 2 minutes, carefully flip and cook the bottom side for 2 – 3 minutes until it’s crisp and lightly browned (the first side will still be pretty soft, that’s ok). Remove from oil to paper towels. Repeat with remaining shells. If desired, reheat and re-crisp in batches, bottom side down, for about 1 minute. Drain on paper towels before filling. Spread a generous layer of beans on the bottom of a hot shell. Top with chicken, lettuce, salsa, tomatoes and crumbled cheese. Serve immediately! ¹ I use Maseca brand instant corn masa flour (in the green and white bag, not the one for tamales). It is pretty widely available in non-specialty shops (Northern California: Target and Whole Foods, Rhode Island: Stop and Shop). However, I haven’t yet determined whether they have a dedicated gluten free facility for production, if that’s a concern for you. Also, Bob’s Red Mill now produces one in their gluten-free facility (I’ve not tried it yet, though). You can purchase it directly from them here.